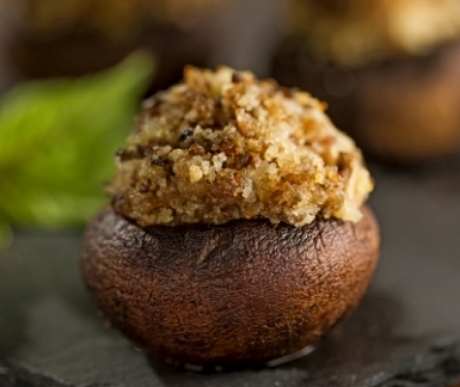 These savory stuffed mushrooms make a perfect appetizer. 2. Prepare cornbread according to package directions. Bake, then set aside to cool. Once cool, crumble 1/3 of the cornbread to make 2/3 cup cornbread crumbs. 3. Wash and dry the mushrooms, then remove stems. Finely chop mushrooms stems, along with 2 large whole mushrooms caps. 4. Cook sausage in a medium saute pan over medium heat until browned. Add the shallots and red pepper flakes, cooking until shallots are tender, about 4 minutes. Stir in the chopped mushroom stems, ½ teaspoon salt and ½ teaspoon pepper, then cook for about 3 minutes. Add butter, stirring until melted. 5. Transfer mushroom mixture to a large bowl, and stir in the cornbread crumbs and Parmesan cheese. Season to taste. 6. Place mushrooms in a buttered shallow baking dish. Stuff each mushroom cap with the mushroom mixture. The filling should form a tall mound. Drizzle mushrooms with the olive oil, and bake until the mushrooms are tender and the breadcrumbs are golden brown, about 20 minutes. Serve warm. Tip: Leftover filling is great on sliced buttered bread as a mushroom crostini.